Back in the Water Again!! We’re finally in the water. Yeah!!!! Just launched Friday; but not until noon due to strong winds again. The crew here at Green Cove Springs marina really know what they’re doing and did a great, i.e., careful, job. First Motu Iti got a little trip on a trailer through the marina. 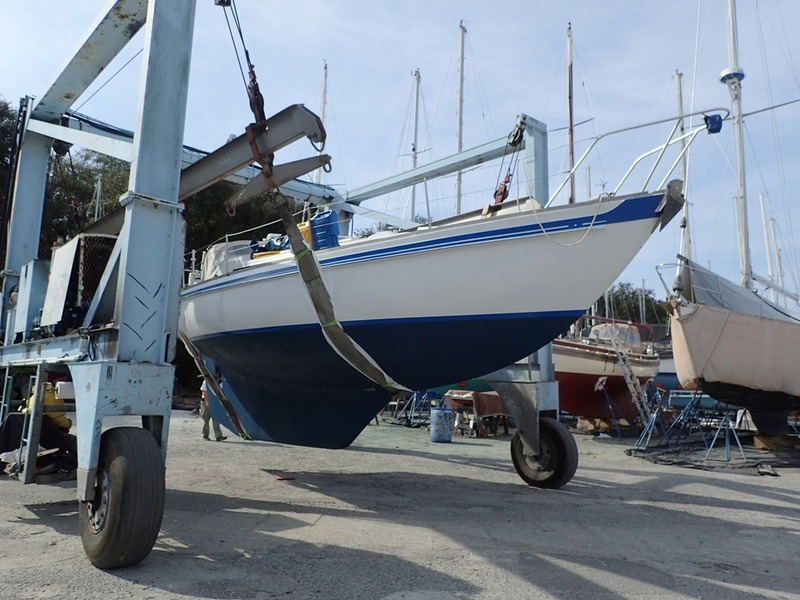 Maybe, in the next picture, you can see Goldwin underneath the boat, on his back, painting a tiny part of the bottom of the keel that couldn’t be painted before when she was on the hard. Now she is perfect and ready to be launched. 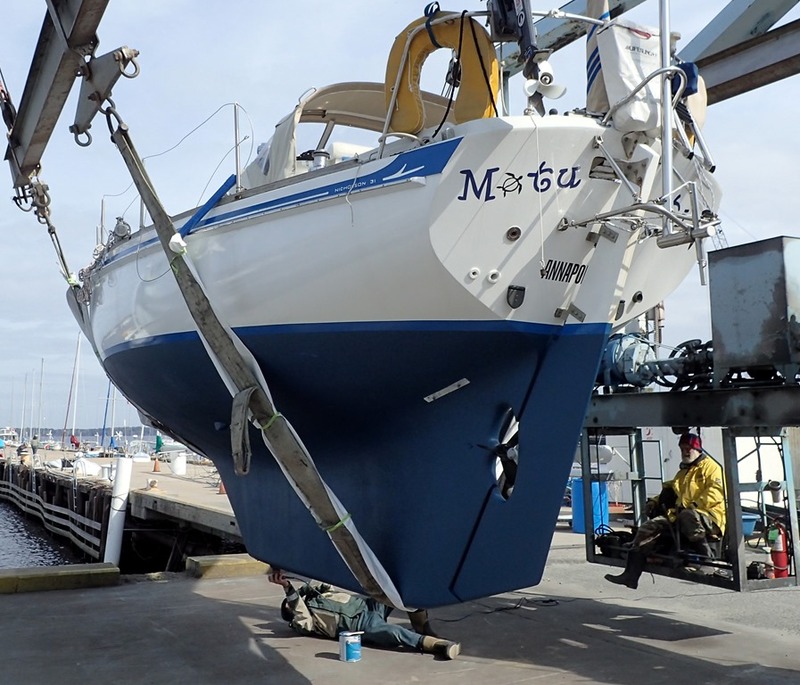 Finally, lowered into the water. Very gently. No drama. Just the way we like it. Now the mast, which had been previously moved to lie horizontally on upright barrels along the dock. A wide webbing strap was tied around it and attached to the crane’s huge hook. 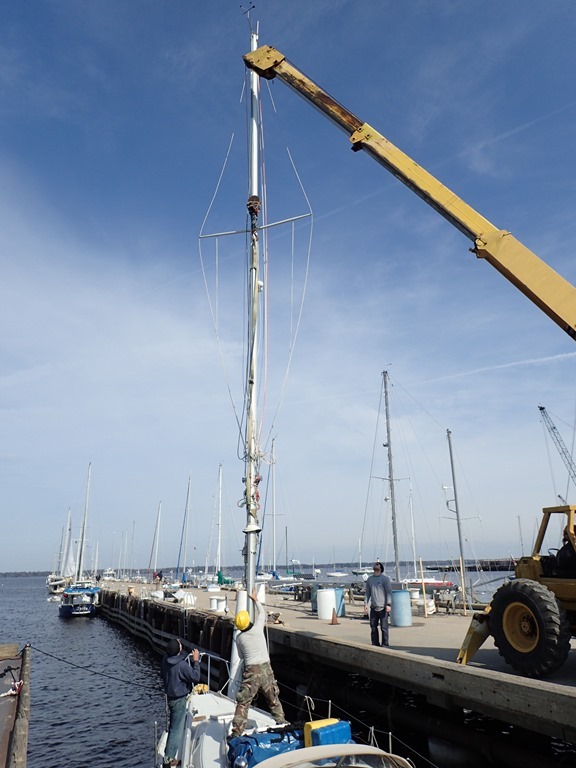 Up came the mast, three guys anchoring the bottom and guiding it to the boat. Then lowered into the boat VERY SLOWLY and CAREFULLY. The bottom seven feet of the mast actually goes through a hole in the deck and rests on the keel (on a silver dollar for good luck). 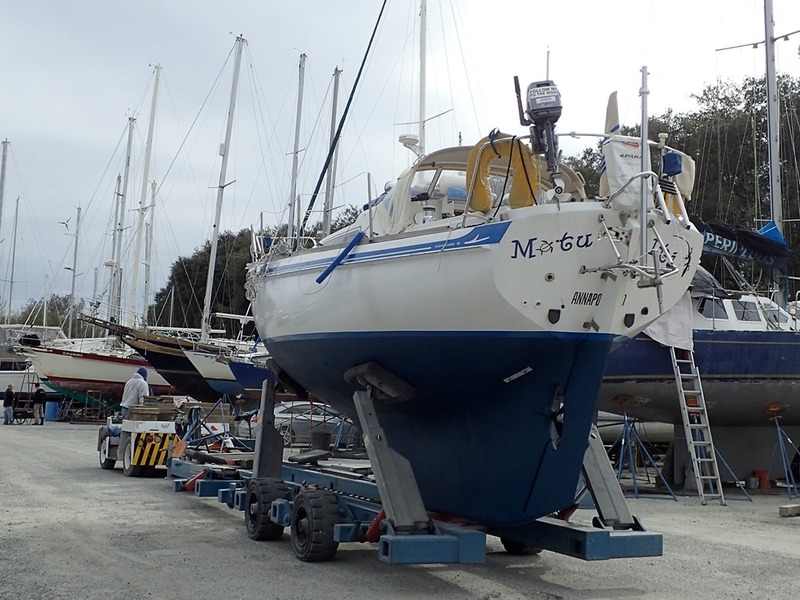 Don’t crush your fingers; be sure that none of the interior wires that emerge at the bottom is pinched or mutilated in the process; make sure the mast is straight and facing the right way; check that the lines and rigging aren’t tangled. The rigging that keeps the mast in place was then connected on both sides and fore and aft. And finally we look like a real sailboat. 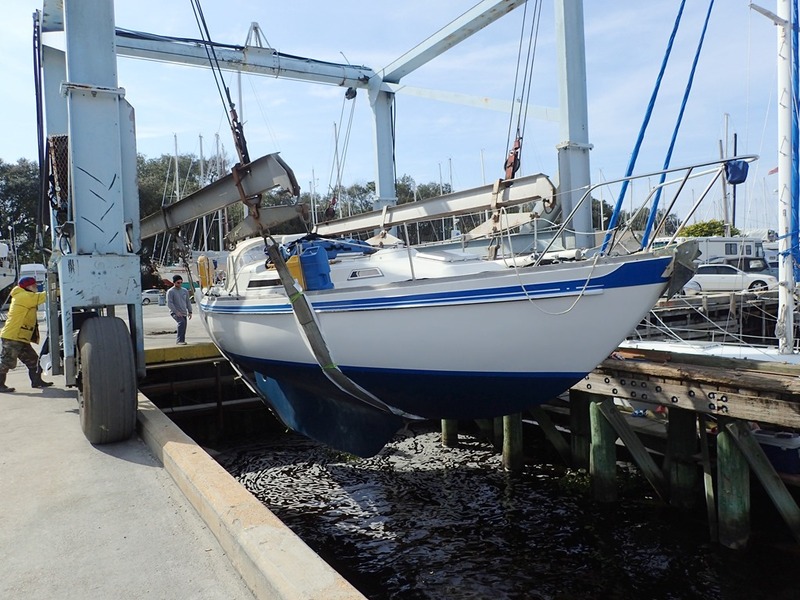 Tied to a dock, (no sails on yet – tomorrow), and going down a ladder to get on the boat instead of up a ladder. Much better. That’s it. Small steps, but in the right direction. 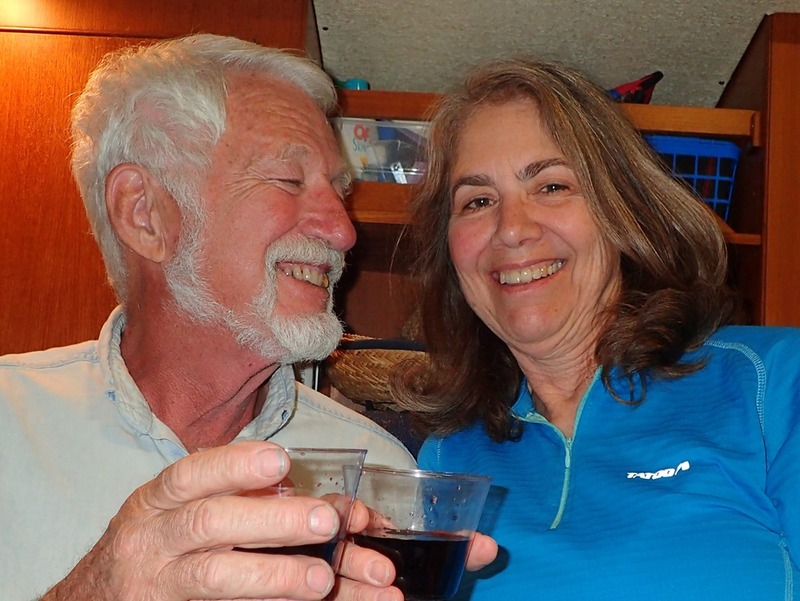 We celebrated with wine and chocolate – no cooking required. So happy to hear you are in the water. I have seen your videos on you tube and subscribed to your blog. We are here in St. Augustine. 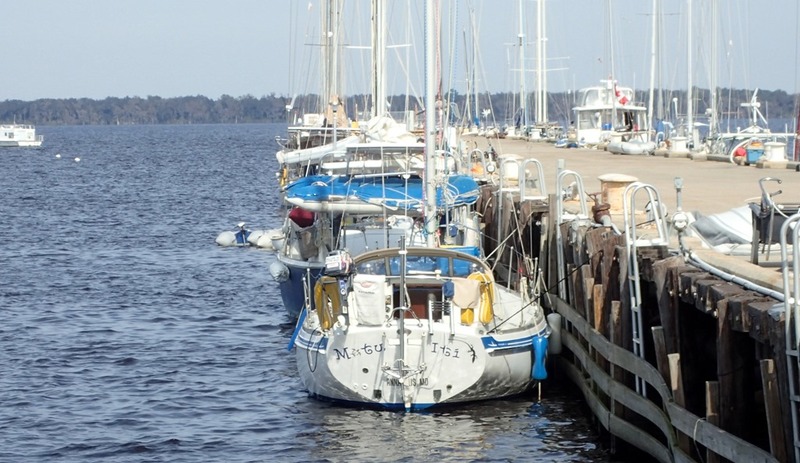 What are your plans once you leave Green Cove Springs? We plan to head south and find warmer weather. Congrats on the successful launch ! Finally! Seems like we are at a snail’s pace. So happy that your bottom is wet again ( I mean Motu Iti of course). Great news to see you are finally in the water! Keep us posted on your crossing day. Winter here but not as much as Mom! Again, I get the chance to live vicariously through my older sister’s escapades. While we deal with single digit temperatures, my sister’s struggles include forcing a “no bake” dinner of chocolate and wine on herself and Goldie. Fortunately for my family Pat exited the expressway and took the back roads to Kalamazoo because he heard about a fifty car pile-up on I-94. It ended up being four times that many vehicles before the night, and the white out conditions, ended. Nancy, please keep up the blog, we love reading it, you write beautifully, and you and Goldie have earned it. May all you winds be fair. So glad to have you following us. Thanks. Smart move, Pat! Congrats! I love the blog. Oh my! I would have been so nervous watching that! Congrats for doing what you both love again! Happy sailing! ← Another Trip – a New Adventure!